The 2nd Annual International T37 World Championship was held August 29th, 2004, in Bellevue, Washington (home of Microsoft). There was a great turnout with about 20 people showing up with 14 beautifully finished boats. It was a real treat to see some of the fine finishing jobs that had been done on these gorgeous boats. And then the racing! Three relaxed practice races at the beginning got everyone warmed up, then the real racing began. Out of 5 races each skipper counted their best three finishes. The course was triangular with an upwind leg, two downwind legs and a second upwind leg to the finish line. 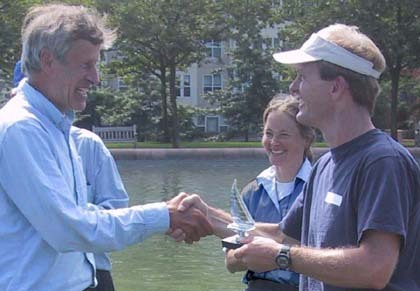 First place went to Todd Staheli (see him receiving his trophy in the movie, below). Todd had three first place finishes for a total score of 3 points. Second place went to Andrew Carson with 6 points. Andrew took first second and third place finishes in his best three races. Third place went to Jack Castro with 6 points. Jack had three second place finishes. Congratulations to all the racers for the fine sailing, the beautiful boats and the fun time. We look forward to having even more skippers with their boats for next years event. Many thanks to Shelly Corbett for sending out the announcements! To download the same movie with a smaller file size and medium quality (ie. faster download) click on this picture (file size 2 mb, file type .wmv windows media video, 287 kbits/sec, film length 1 minute). To download the movie with a lower file size and lower viewing quality (faster download) click on the picture above (file size 500kb, file type .wmv windows media video, 57 kbits/sec, film length 1 minute). 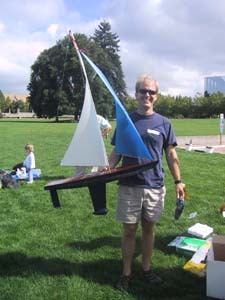 Picture shows Ken with his beautifully finished boat. Ken is going to send us a photo of his RC float plane on Lake Sammamish sitting beside his T37 yacht. To download the movie with the lowest file size and lowest viewing quality (fastest download) click on the picture to the left (file size 325kb, file type .wmv windows media video, 42 kbits/sec, film length 1 minute). Presentation of the awards took place after the fifth race. Todd and his crew took home the trophy for the 2nd Annual International T37 World Championship.Thanks to all the participants for a great day!